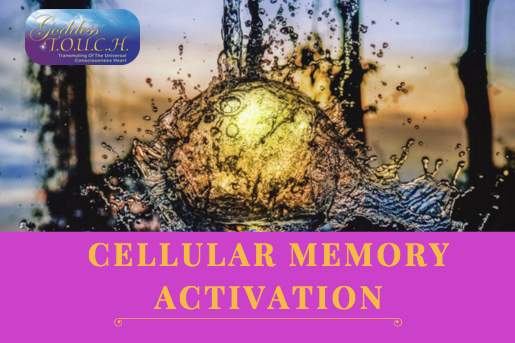 Celullar Memory Activation - Goddess T.O.U.C.H. Rapid shifts of Consciousness are occurring whereby “healing” modalities are becoming outdated to Earth’s ever increasing frequencies. In flowing with these currents (time is collapsing and space is expanding), the focus now is that of ACTIVATION of our Perfection. This is the key to connect and anchor our spiritual, mental, astral bodies into your physical body. In other words, our DNA is changing (see DNA by Dr. Berrenda Fox). Our limiting beliefs stemming from fear, cause us to experience a lack of perfect health, inner peace, prosperity, etc. As these structures “fall away” gently, quickly and completely, with intent during your ACTIVATION session. Healing is now the ‘by-product” of the life-enhancing Goddess T.O.U.C.H.® technique. To give you better idea, one of the numerous journeys of Activations I have experienced, this one occurred in 2002, which you are welcomed to read. See Article – Ascension, Descension, Inscension. Open and expand where you will be relaxed and fully conscious, allowing you to experience the Love and Light that you are. Activate your vibratory rate, bringing on healing on different levels. -Entities/dark forces that you have allowed (on some level) into your aura, body, home, office, car, etc. must be released. Empowerment – to create a refreshed, stronger, calmer, and happier You! You will feel empowered!